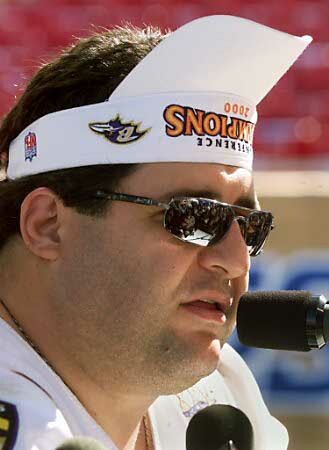 Tony Siragusa is the nuclear option in Fox Sports’ ongoing war against dramatic pause. Every Sunday he roves the sidelines ensuring that even the slightest moment of dead air is filled with sense-dulling stupidity. “I love coming to Cleveland because they’ve got the best nacho cheese in the league here. Ok, back to you guys.” Last week, he told viewers that Redskins quarterback Mark Brunell had been practicing all week with wet balls to prepare for the depressing perpetual downpour in Seattle. Not content to leave it at that, he then demonstrated the act of submerging a football in a bucket of water. If Scooter the Talking Baseball wasn’t evidence enough, it should now be obvious that Fox’s interest is machiavellian masochism rather than the enjoyment of genuine fans. They know that you will watch, and they want to make it hurt as much as possible. It is therefore left to us to take action, get involved, and improve the quality of our football experience. Here are some thoughts I had, which I urge you to try the next time Siragusa visits your NFL city. Bear in mind that these may require felonious access to the playing surface. “Steal his nose,” refuse to give it back. Let Siragusa chase you for three hours. Stage a sham rib cookoff near the stadium prior to kickoff; lace Tony’s racks with Lunesta. Ok, back to you guys.